The Best Concealed Carry Gun should not be a burden. For years I carried around my Smith and Wesson XD .45 full size only to constantly be uncomfortable and annoyed with the size and weight of this gun. Although I love the function of the gun and often still carry it, I now understand that there is a gun for every task and concealed carry is not in the XD.45 full size bag of tricks. This was my Concealed Carry Gun Mistake number 1. My second mistake with the XD.45 was that it printed bad, no matter where I put it or what holster I had it in. Let my mistakes be a lesson to you, Buy a gun that fits your body shape. Although it is possible to reduce printing through the use of different holsters such as inside the waistband if you pick the wrong concealed carry gun for your body type then you will always have problems. What Size is the Best Concealed Carry Gun? Automatics come in four general sizes, these sizes vary quite a substantial amount so be sure to pick on that fits your style. • Full Size – with a barrel length of 4.5” – 5”, and all the fingers of the shooting hand can fit on the grip of the gun. Although these guns function great they will be difficult to conceal no matter your frame. • Compact – with a barrel length of 3.5”- 4.5”, may have a full grip or may have a slightly shorter grip depending on the model. Compacts can be great concealed weapons for larger framed individuals. • Sub-Compact- Has a barrel length of 3.5” or less, and has a shorter grip frame than a compact, generally allowing only two fingers to grasp the frame. Great concealed carry guns for members with smaller frames. • Pocket – Has a barrel length of 3” or less and is smaller in overall size than a standard sub-compact. Great to conceal may not be great to shoot. Due to the difference between size and length of Revolvers we wont go into detail. All you need to know is that the smaller the frame the easier it will be to conceal. 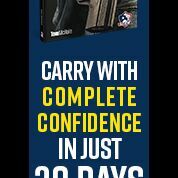 Picking a Concealed carry gun that is right for you will be the key to your success. Caliber is another area that stems from the weapon, your experience, and weight. Although a .22 weighs less it does not have the stopping power of a 44 magnum. Don’t get me wrong there are a number of accounts where a would be attacker was stopped with a single shot of a .22, but as studies have shown it often takes more than one shot to subdue and attacker with a .22. Remember that the more rounds you have and the bigger the rounds means more weight and less comfort when carrying concealed. When push comes to shove you don’t want a gun that is not going to function or that is so complicated to use that it will slow your self defense. When picking a concealed carry gun your not looking for bells and whistles. You are however looking for reliability comfort and functionality. The Best Concealed Carry Gun should be easy to operate under stress when you have less dexterity and fine motor control. You want to pull the trigger and hear the boom not a click. There is no need to get a custom engraved 1911 when sometimes all you need is a Hi-Point to defend yourself. Set limits to what you are willing to pay, and standards for what you want in the gun. This will narrow down the list and then you can pin down the perfect gun for you. Remember just cause it is made of gold, doesn’t mean that it can shoot lead! Remember that my top recommendation for the Best concealed Carry gun may not be your top pick for the best Concealed carry. So be sure to pick a gun that is right for you and that you are comfortable with. Don’t make the same mistakes that I have made and do a little research before you buy.